Subscription boxes are a thing of modern times and with a box for practically everything you could ever need, it can be difficult to know what to go for. When I first made the change to cruelty-free, there wasn't a dedicated box and I felt like I was missing out. Luckily, things have changed in recent years and there's now so many great options. For me, there's nothing more exciting than my box arriving on the doorstep. I was kindly sent October's LOWTOXBOX subscription box to review. Keep reading to find out more about the box and what's inside. 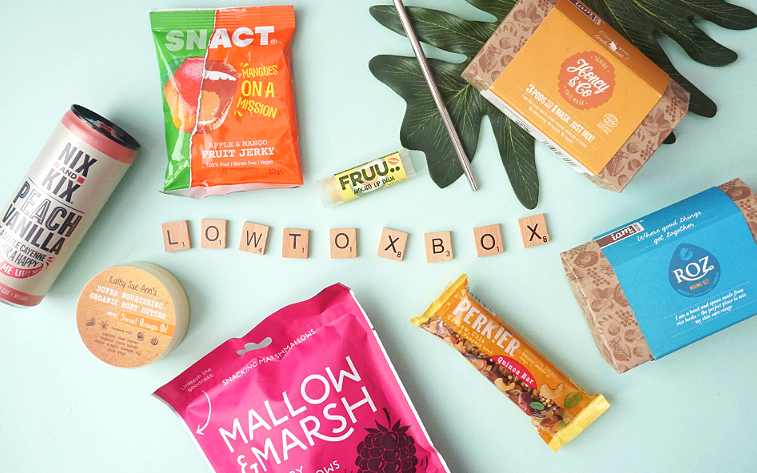 LOWTOXBOX is a monthly subscription box aimed at consumers looking to live a more eco-friendly lifestyle. The box contains up to 8 items which are a combination of Organic, Natural, Fairtrade, Healthy, Ethical, Eco-friendly, Cruelty-free and Vegan. 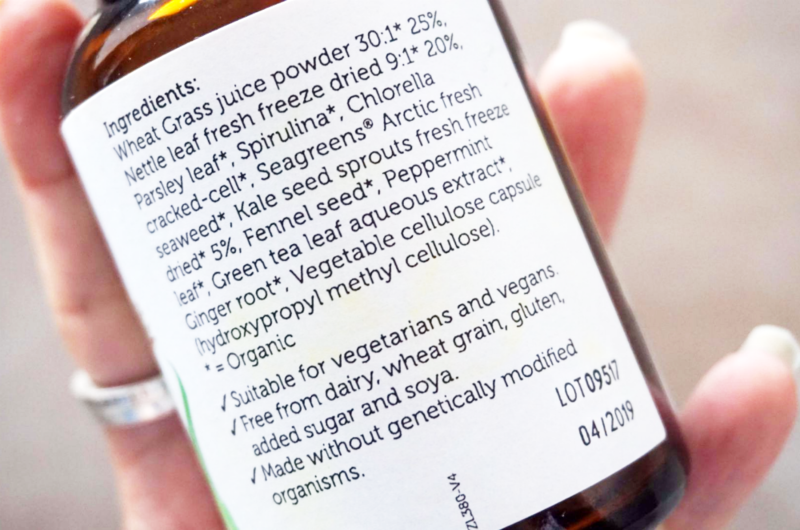 Founder Lucy explains how her journey discovering natural alternatives became a challenge and how this motivated her to create an easier way to discover greener products. "I became interested in natural products when I was suffering with a skin complaint and I was being prescribed different medicated shampoos - none of which helped..."
"Spending hours researching, I compiled a database of natural products I wanted to try, from skincare, to cleaning products, all the way through to snacks, teas, toothpaste and suncream! 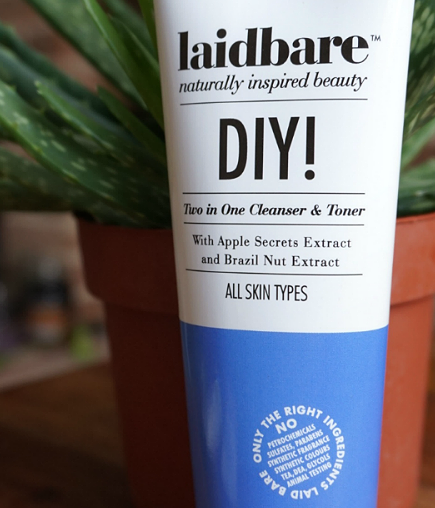 After my friends and family took an interest, I felt there was a definite need for an easier way to discover how to eliminate nasties from your daily routine." Not only are the products inside eco-friendly, the box packaging is fully recyclable and only non-toxic inks are used for printing. 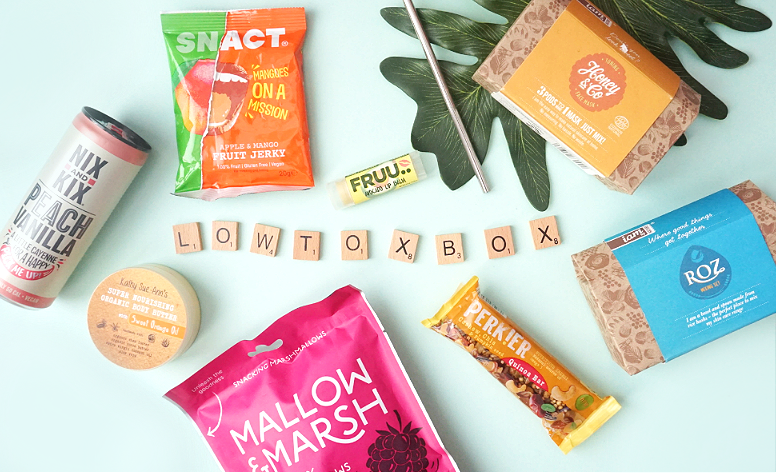 What really makes this box stand out from the rest is that LOWTOXBOX partners with the Green Earth Appeal to plant a tree for every box sold. Shortly after purchase, you'll receive an email with your Planting Certificate attached. The box first launched in March this year has been featured in Tatler Magazine. Iam By Nature is a natural, organic brand that uses 100% recyclable packaging and water based ink. 1% of their profits go to Find Your Feet who support poor rural families to sustainably grow organic food. The Honey & Co Face Mask comes with 3 pods that are mixed together to form a thick paste for single use. Ingredients include Honey for hydration and Lupin Flour to help even skin tone. My favourite product in the box is the ROZ Skincare Mixing Set also made by Iam By Nature. The bowl and spoon are made from rice husks, the hard outer part which is usually thrown away. It comes in a handy mesh bag which makes it easy to store. This is such a handy set for mixing your own face masks and a great alternative to plastic. I'm so glad I was introduced to this. Nix & Kix are a vegan friendly brand who pride themselves in producing natural, sugar-free, low calorie drinks. Their drinks range contains a subtle kick of Cayenne making it truly different to anything I've ever tried before. They can be enjoyed on their own or added to Mocktails and Cocktails. The Peach Vanilla flavour is so tasty with the Cayenne only adding to the flavour. I expected it to be spicy but it's actually really subtle. I'm now on the hunt to find the rest of the range! Perkier produces natural snacks with the highest quality whole foods. 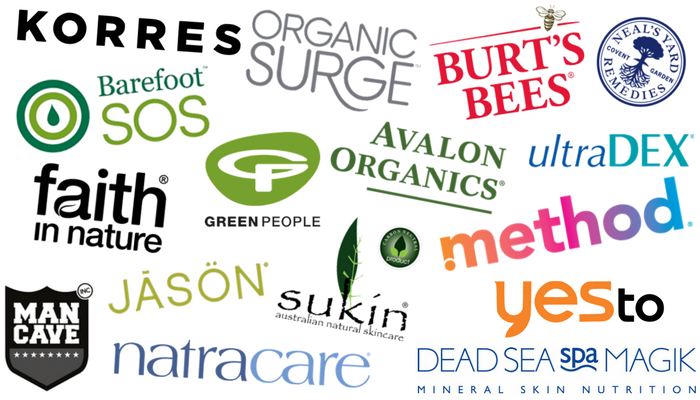 Their products are 100% vegan, rich in omega 3 & 6 and free from Gluten. You can pick up their bars in most major supermarkets and health food stores. 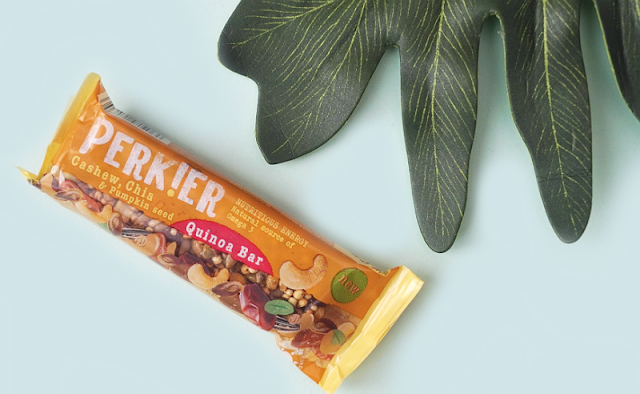 Unfortunately the quinoa bar contains nuts so I was unable to try it myself, however I gave it to the boyfriend who said it was really tasty and would buy it again. 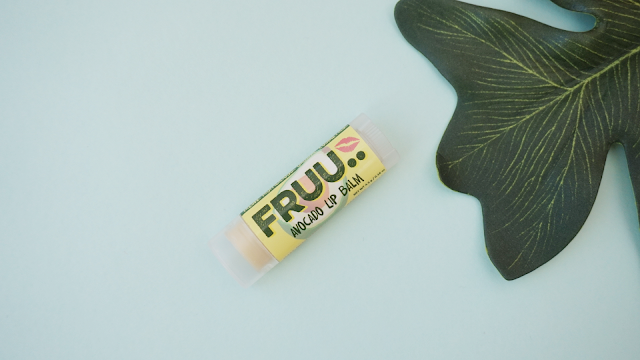 Fruu is a cruelty-free, vegan friendly brand that have a great choice of fruit flavoured lip balms. They source the freshest, sustainable ingredients and most of the ingredients used in their products are produced as a by-product from processed fruit waste. This particular lip balm is made with organic avocado cold press oil, coconut oil and Aloe Vera. I'm not really a fan of heavily scented, flavoured lip balms as they tend to make my lips sore so I am yet to try this. It doesn't smell heavily scented so I may give this a try once my current balm has run out. 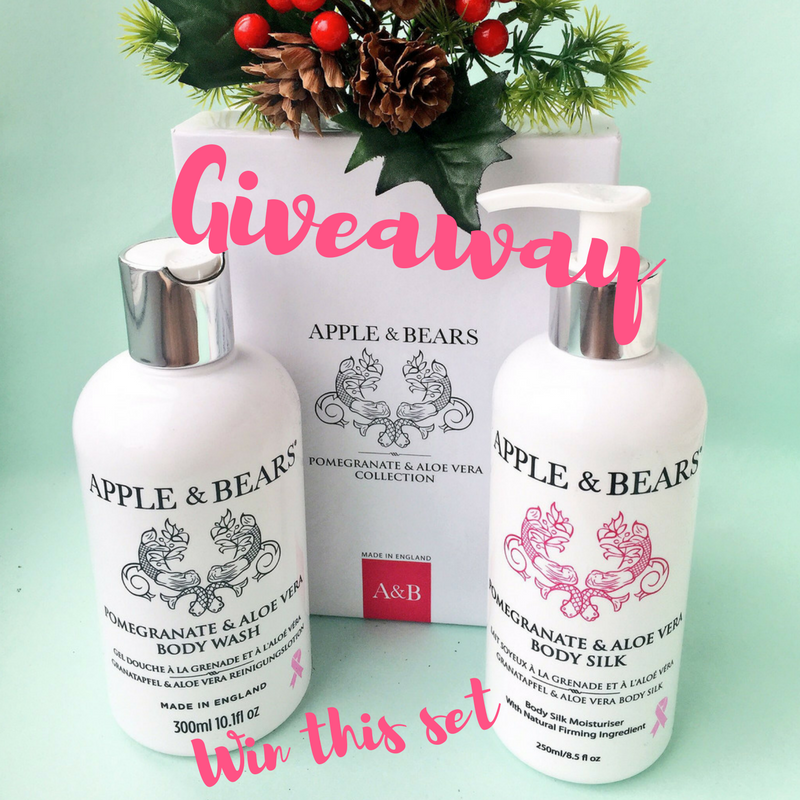 Kathy Sue-Ann’s is a cruelty-free UK skincare brand that produces organic body butters. 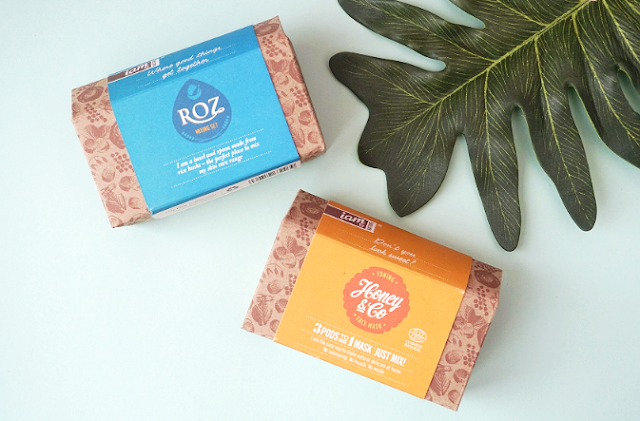 Their products are free from nasties, artificial scents and palm oil. I absolutely love the smell of the Sweet Orange in this, it reminds me of dried Christmas decorations. This sits on my desk at work and I apply it to my hands when required. It's quite greasy when you first apply but it soon soaks in, leaving your skin feeling really hydrated. Sadly, my skin is too sensitive to apply this all over my body but I can imagine this would work wonders for dry knees and elbows. This is a real treat for dry skin. Ecostraws are a brand that produce eco friendly, BPA-free straws that are a non-toxic alternative to disposable plastic drinking straws. They are manufactured using high quality food safe stainless steel and are super durable. I haven't used a stainless steel straw before and I thought it would have a metallic taste to it but this isn't the case. Everyone should have one of these in their household, it's such a simple way to reduce household plastic. 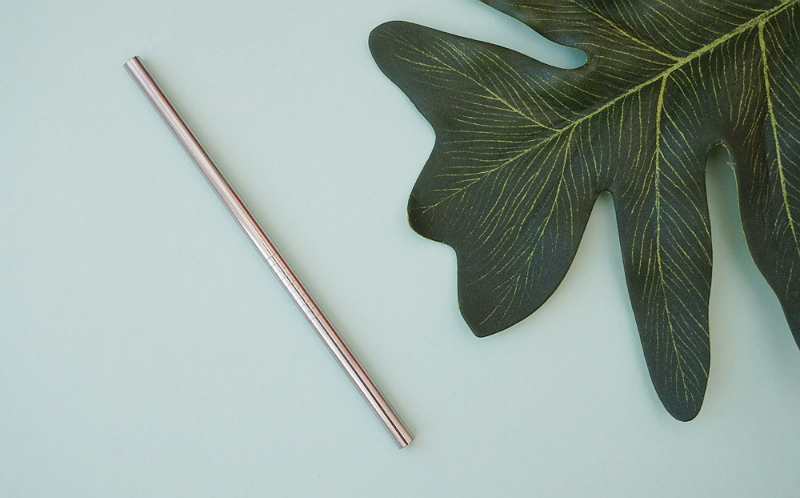 Ecostraws don't just produce stainless steel alternatives, they also make bamboo, glass and wheat straws. 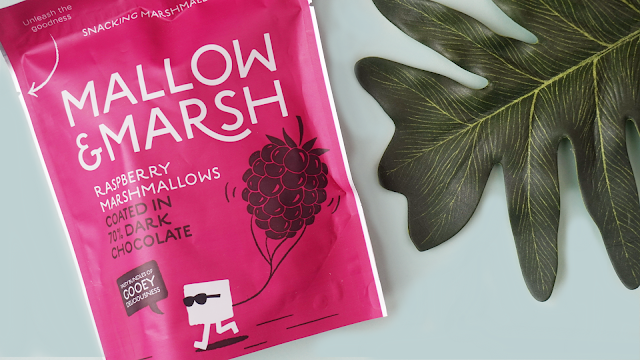 Mallow and Marsh produce luxurious marshmallows coated in chocolate using the high quality ingredients. Their products are gluten free and free from additives or preservatives. Sadly, these aren't vegetarian or vegan friendly as they contain gelatine. It's a real shame to see these in an eco-friendly box and I think a vegan friendly option would have been better suited. 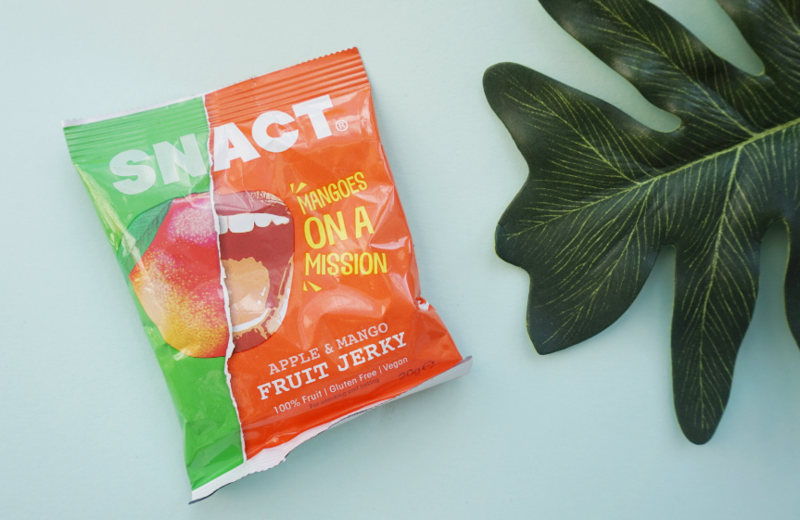 Snact produce sustainable snacks and have been tackling food waste since 2013. Their first product, the Fruit Jerky, was made by hand from fruit collected from wholesale London markets. The packaging can be composted at home making them a truly eco-friendly brand. The fruit jerky is vegan, free from gluten, added sugar and anything artificial. I really enjoyed the taste of this particular flavour. This would make a great afternoon snack to tide you over until your next meal. LOWTOXBOX is the first eco-friendly subscription box I've tried and I have to say, I really enjoyed the variation of the products inside. My current subscription is purely beauty based which I think after a while, I'd like to change in fear of it getting boring. I felt like I actually learnt something from this box, I learnt that whole foods don't have to be boring and that we really don't need to be using plastic when there are so many alternatives out there. I would recommend this box to anyone who is looking to start living more eco-friendly and to anyone looking to discover new and exciting brands who are making the world a better place. Have you tried the LOWTOXBOW? What are you thoughts? Leave a comment below. Please note: This post contains PR samples however opinions are honest and are my own. When Autumn starts to creep in, I find myself showing more attention to my skincare routine. Blustery, chilly days play havoc on my skin and keeping it under control can sometimes be a battle. I am prone to dry hands, legs and a dry face. I was sent to sample a handful of products from natural skincare brand, Urban Veda. I hadn't heard of the brand before but after doing a bit of research, they seemed right up my street. Carry on reading to find out more about the brand and the products I tested. Urban Veda focuses on one of the oldest holistic healing systems, Ayurveda. Ayurveda is composed of two words, Ayur meaning "life"and Veda meaning "knowledge". This ancient form of healing is based on the philosophy that to live a healthy and productive life, we have to balance our mental, physical and spiritual well-being. Urban Veda's state their products "have been developed with Ayurveda principles to target primary skincare needs of the three doshas. The central concept of this Ayurvedic skincare approach is to maintain your dosha’s natural balance, helping to keep skin in optimum health." Ayurveda is based on three main body types, which are known as doshas. Doshas are known to convey everything about us including our skin types, health and personalities. The three main types of Dosha are: Vata, Pitta and Kapha. My dosha is Pitta which suits dry and easily irritated skin and when stressed, anti-inflammatory and fever-reducing essential oils best suit me. This is the range I tested. I should start off by saying that the Pitta skincare range is one of the best scented I've ever used. The blend reminds me of going to the spa and experiencing the luxurious, aromatic oils. The range has a true autumnal scent which definitely suits my style. Sandalwood and Ylang Ylang really stand out and instantly relaxes the mind, body and soul. The Pitta Soothing Body Scrub was the first product I tried. It has a gentle exfoliation making it more suited to sensitive skin. The exfoliating ingredients are crushed Walnut and Volcanic Pumice meaning there's no artificial beads inside. I use the scrub regularly along with the Body Shop Hemp Body Mitt on the back of my arms and legs as I suffer with severe Keratosis Pilaris. The product does help to reduce bumps but I suffer so severely that this just isn't exfoliating enough for me, unfortunately. It does however leave skin really soft, hydrated and has a lovely lasting scent. The Pitta Soothing Body Lotion although heavily scented, is really gentle for sensitive skin. The formula is light in consistency and is easy to apply. I use this regularly on my hands, arms and feet and it keeps me hydrated without the need to reapply as the day goes on. Due to my eczema, body lotion is honestly one of the hardest things for me to buy so it's great to find a lotion that doesn't irritate. I absolutely love that the scent lasts all day! The Pitta Soothing Exfoliating Facial Polish was the last product I tried in the range. If I'm honest, I have used this much, not because I don't like it, I'm just currently happy with my face routine and any drastic changes usually causes me to break out or dry out. I think once my current products have run out, I'll give this another chance. I have noticed that the exfoliation is again, really gentle and I can see why this is suited to the Pitta range. It has the same scent as the other products and the times I have used it, I've applied at night before bed which really helps to wind down after a stressful day. I'm so glad I was introduced to the brand and I hope to have enlightened some of you. 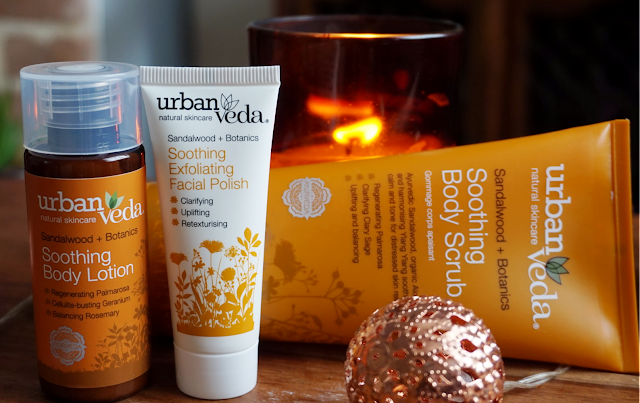 I would recommend Urban Veda to anyone who is looking for a more ethical, botanical choice of skincare that smells great. 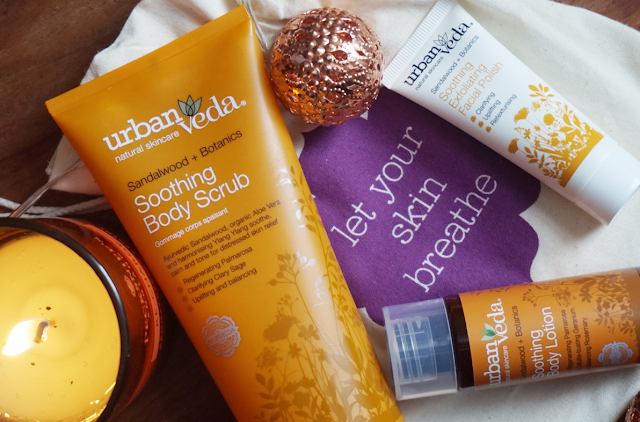 Have you tried anything from the UrbanVeda range? Leave a comment below. I live a pretty hectic life. Working a fast-pased, high-pressured job which can often fall out of the 9-5 hours means if I don't look after myself or take time out, I'll start to feel under the weather. Add Chronic Fatigue into that and most days are a struggle. Supplements are essential to my everyday wellbeing. 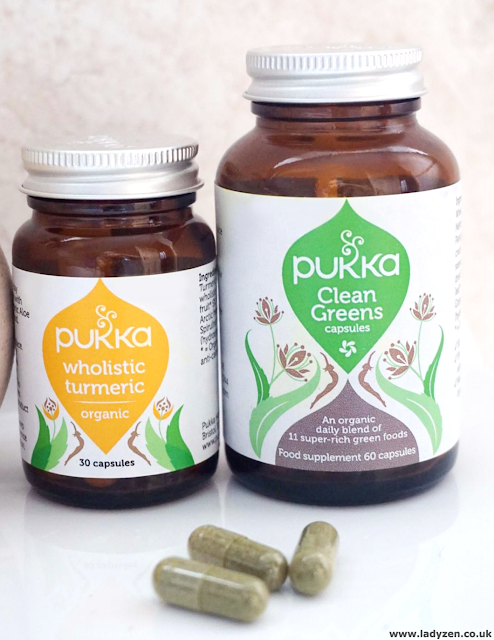 I attended the Pukka blogger's event in Whole Foods Market, London back in July and I learnt that not only do Pukka produce Tea, they produce a wide range of organic supplements. I was kindly sent their Wholistic Turmeric and Clean Greens Capsules to try and here are my thoughts. These capsules are an organic blend of 11 green super foods including Spirulina, Nettle leaf and Grass juice. 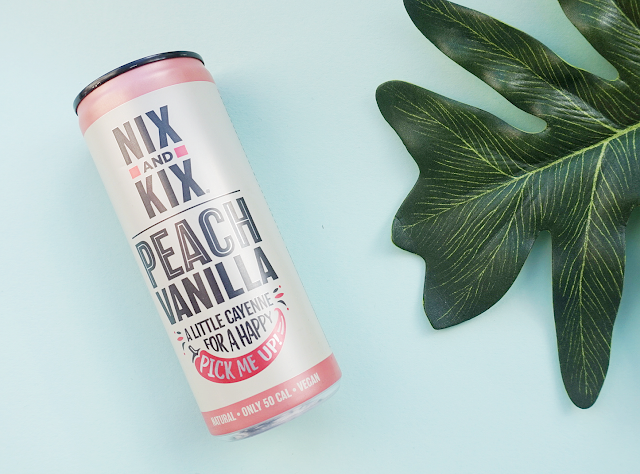 The formula is packed full of highest organic grade of sustainably cultivated herbs and fruits so you can rest assured it's as nature intended. Pukka note on their website that this blend naturally supports the body's ability to cope better with our polluted environment and supplement our diet. I'm awful at getting my 5 a day and these capsules have helped me work towards that. I have been taking one a day for over a month now and I have noticed some positive changes. I suffer from IBS and I have had less cramping and constipation while taking these. Getting up in the morning is easier and I do feel like I have more energy throughout the day. If you struggle taking capsules, you can purchase this blend in powder form as well which can be mixed with water, added to smoothies or even made into ice lollies. I sampled the powder form at the blogger event and I was so surprised at how nice it tasted. The dark green colour may put you off, but it really doesn't taste how it looks and Ill definitely be purchasing it once the capsules run out. I would recommend this blend to anyone suffering with low energy levels, digestive concerns or anyone looking to up their green intake. You may or may not have heard the recent hype of Turmeric which has popped up again in the media. Turmeric has actually been used for many different purposes for thousands of years. In fact, it has many uses and is proven to benefit us in so many ways. A quick search online will bring up 100's of benefits including treating joint pain and arthritis, preventing many health problems, boosting the immune system and encouraging healthy skin. Plants are powerful things! 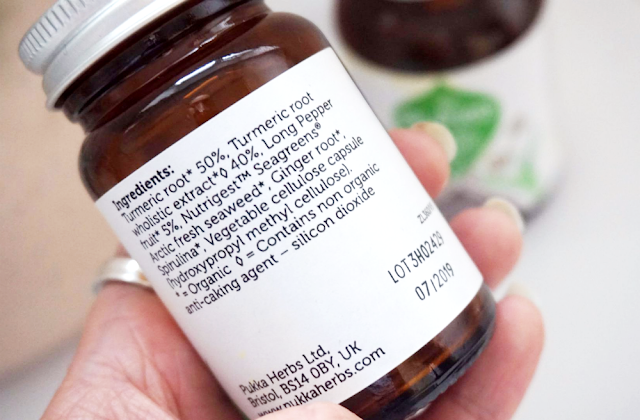 Pukka's "Wholistic" technique uses a combination of extractions which capture the broadest spectrum of compounds found in plants including it's essential oils, waxes, resins and pigments. This means the final product is several times more potent than the standard herb supplements on offer. This type of extraction is also good for the environment as it doesn't use harmful chemicals such as acetone and methanol (which aren't good for our planet or ourselves!) which is usually used to extract herbal compounds. I have been taking one capsule a day for a month and I have noticed a significant improvement to my complexion. I get less spots and overall my skin looks a lot brighter. I feel more confident in not wearing full foundation which I'm so happy about as I've always worried about my skin. As for my joints, they have helped to ease my everyday pain and alongside my regular magnesium baths, I have noticed a positive change. Although my joint pain will never fully go away, it's great to find a natural alternative to medication. I will definitely be buying these again, as for me, it's impossible to ignore the benefits of this wonderful plant. This post contains PR samples but opinions are my own and are honest. I have often taken East Anglia for granted. I grew up in Suffolk, Ipswich to be precise. When I was a teen, days out would usually involve shopping in Norwich or going a bit further afield to London. I never really thought about days out anywhere else in the East of England. As I've grown older, I've started to appreciate and respect my small part of the country and the variety of things there are to see and do here. Acres and acres of countryside and coasts fill the East of England with some truly stunning cities and market towns nestled inbetween. Alongside this, we have some of the oldest recorded towns in the country and some beautiful architecture that reflects this. 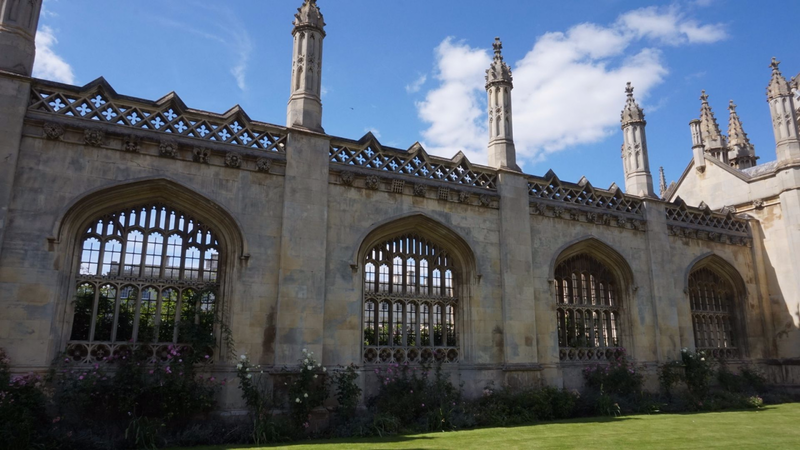 I was recently given the opportunity to travel with Greater Anglia Trains to the beautiful city of Cambridge and Punting for 2 with Visit Cambridge. Our train journey started at our closest train station, Sudbury. We set off early as total travel time was 2 hours, 20 minutes and we wanted a full day to explore the city. Our train arrived on time and wasn't overly busy which was a bonus. We really couldn't have picked a better day weather wise, the sun was out and it was quickly starting to warm up outside. My worst nightmare is travelling on public transport with no air conditioning on a hot day and I was so relieved that every train we used had air conditioning. Once we were on our last change of the journey, we sat back, relaxed and took in the stunning views of the countryside. For me, travelling by train adds to the adventure and you get to see so much more than you would when driving, and without the added stress. This wasn't my first time to Cambridge but nonetheless, I was really excited for the day ahead. There's something truly magical about the city; streets lined with boutique coffee shops, cobbled streets, and bicycles are the way to travel. You're never too far away from beautiful architecture so you can see why this is a very popular tourist destination. It's said that J.K Rowling was inspired by the famous Cambridge University and it's grand dining halls which, have said to have inspired the Great Hall of Hogwarts. Once we arrived in Cambridge, it was a short walk into the centre and to our boarding location for our punting tour. 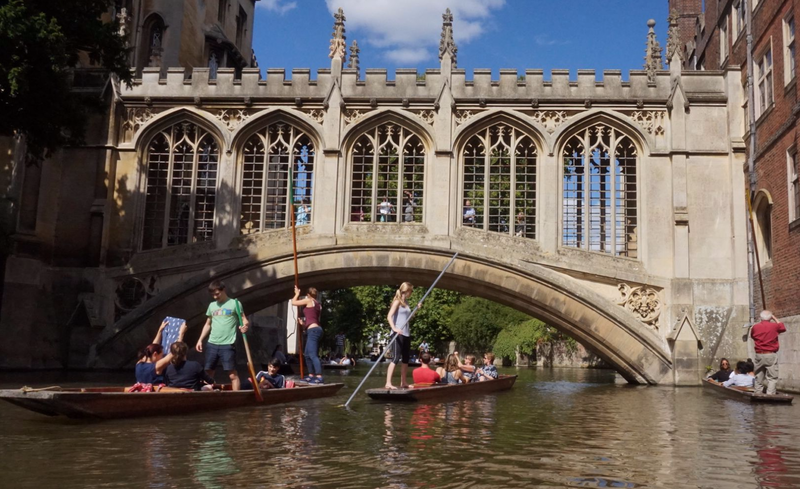 I've been wanting to go punting ever since I discovered it was a big thing in Cambridge. 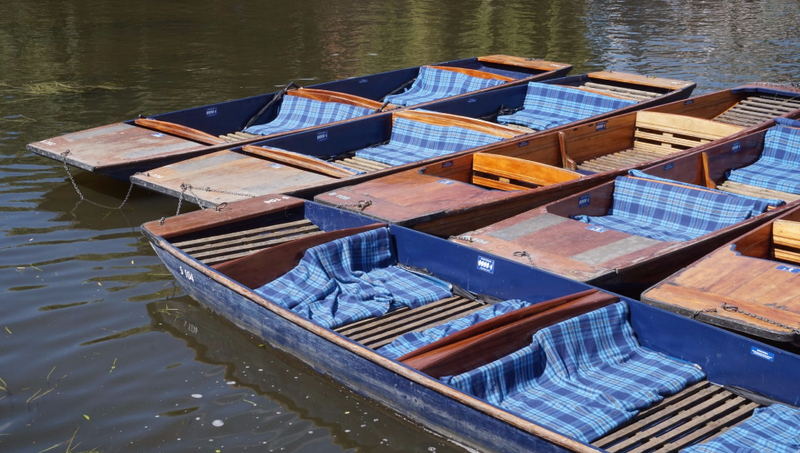 There are various punting companies to choose from along the river and you have the choice of going on a guided tour or giving a go yourself. We took the 45 minute guided college tour with Scudamore's which took us along the river past the famous Trinity College. As it was half-term and the first hot, sunny day in a while, it was really busy and we had to wait an hour for the next tour. I would advise getting your tickets as soon as you arrive so you don't have to wait too long. This wasn't a problem for us as it gave us the opportunity to see the hustle and bustle of the city. The punting tour itself was so informative and such good fun. Our guide was clearly spoken and gave us an insight into the life of a Cambridge University student and the history of the colleges. 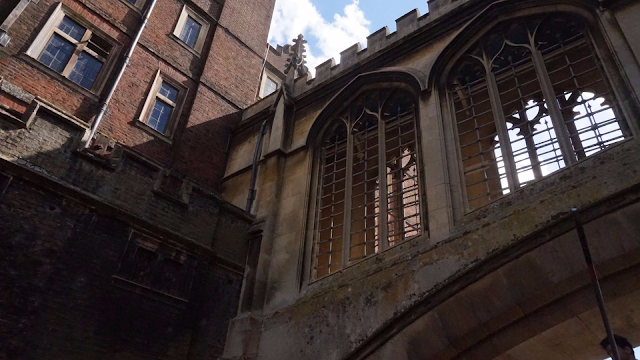 The highlight for me were the beautiful bridges we travelled under including the St John's College Bridge of Sighs. The river itself was incredibly busy and there were a few near misses, mostly from people doing it themselves. Our guide said people often fall in but we didn't see that happen, luckily! The boats themselves have umbrellas and blankets for rainier, colder days so they really do operate all year round. I'd like to go back in Autumn to see the leaves changing and when it's less busy. After the tour, we headed back into the centre and grabbed a quick bite to eat before heading back on the train to embark on our journey home. I'd recommend Cambridge to anybody looking for a day out destination, as there's so much to see and do and it's so easy to get to by train. Punting was an amazing experience and I'm so glad I've finally done it! I think next time we head to Cambridge, we'll give punting a go ourselves (If I can pluck up the courage to trust the boyfriend). 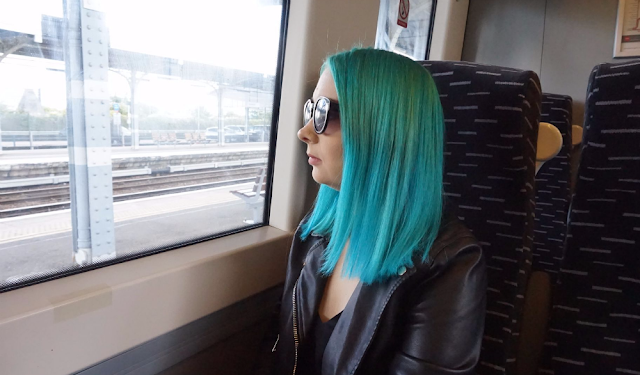 If you're heading up from London, you can catch the train from Liverpool Street Station and the journey takes around an hour and 20 minutes. You'll be sure to catch the stunning East Anglia countryside along the way. There are so many great destinations to visit in East Anglia and summer is the perfect time for it. Whether it's visiting the coast, shopping, museums or admiring the countryside, you'll never be stuck for something to do. 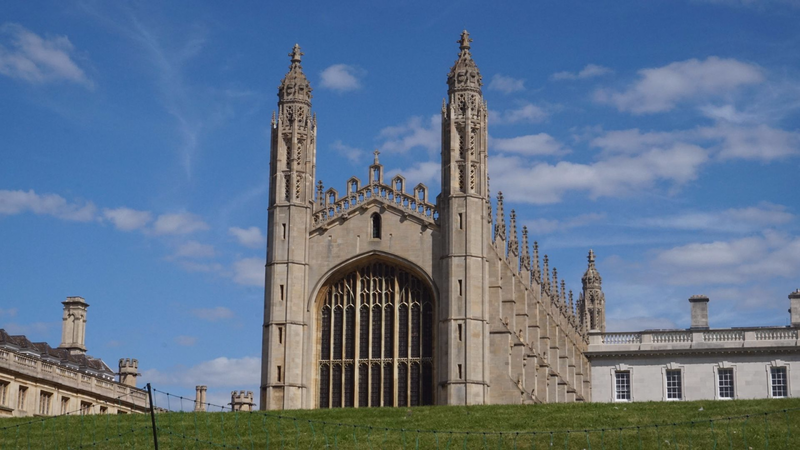 Greater Anglia offers great value off peak fares with 2FOR1 on top London attractions and if you book in advance, tickets from Norwich to London are available at just £10, Cambridge – London at £7 and Southend-London just £5 one way. Accompanying children travel for just £2 return. You can now also purchase advance on the day up to 10 minutes before departure and this costs less than the equivalent single ticket. Have you been to East Anglia before? I'd love to hear where! Leave a comment below. This post contains PR samples but the opinions are my own and are honest. Before I made the decision to go cruelty-free, the weekly shop wasn't something I thought too much about. I would usually pick up whatever was on offer, without even glancing at the back label. Back then, I wasn't aware of the vast amount of brands that test on animals and I don't blame myself for that, I just think there wasn't the awareness that we have today. With more and more people opening up their eyes to animal testing, here's my guide to cruelty-free labelling and how you can buy cruelty-free on your weekly shop without the worry. 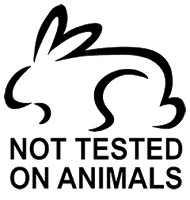 The Leaping Bunny Certification is the international standard for brands producing non-animal tested products. Cruelty Free International are a non-profit organisation who are passionate and work tirelessly to help brands to validate their consumer products as cruelty-free. 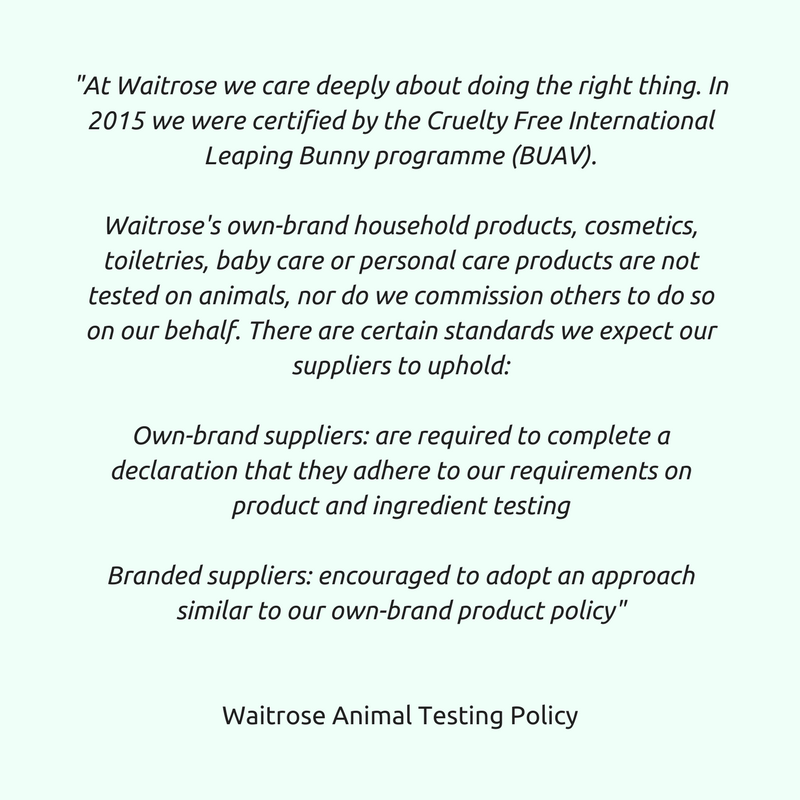 The Leaping Bunny logo is issued to companies which produce cosmetic, personal care and cleaning products and which comply with the Humane Cosmetic and Humane Household Product Standards. 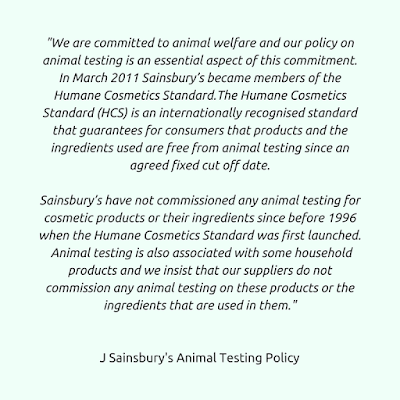 It remains the most trusted cruelty free certification out there. PETA has it's own cruelty-free program and logo to go with it. There has been some criticism on the way brands are awarded this certification, they are assessed by completing a questionnaire and asked to sign a statement and, that's literally it. There's no monitoring system in place to ensure these brands are telling the truth. You're quite unlikely to see this logo on UK products as this is used more in the US. CCF is an Independent, non-profit organisation based in Australia. 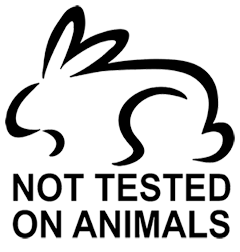 They actively campaign to end animal testing of cosmetics, personal care and household products. 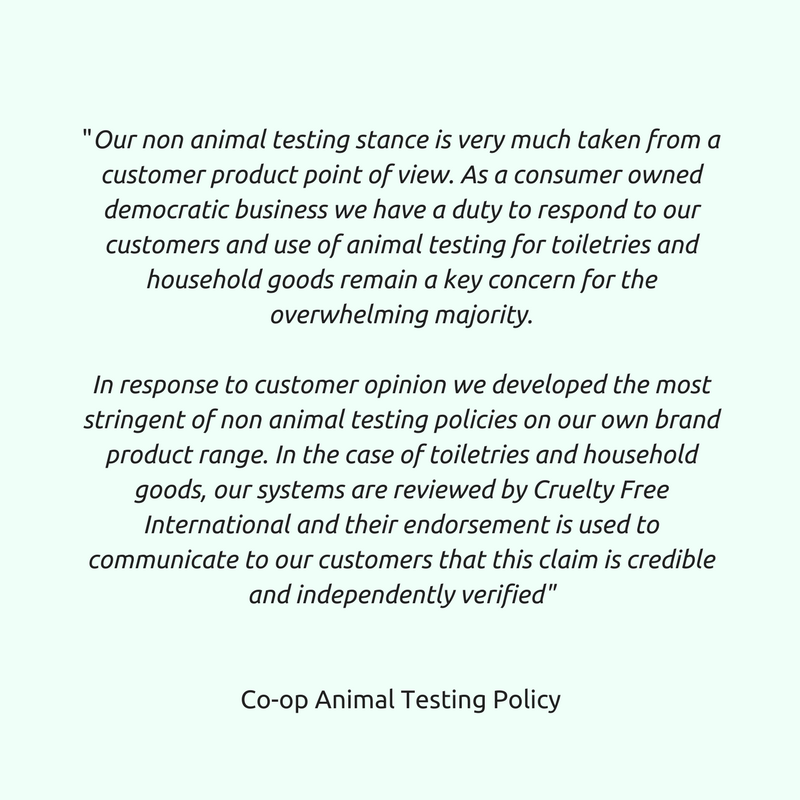 CCF will not accredit cruelty-free brands unless their parent companies are also accredited. Brands on the CCF list are regularly asked to undergo re-accreditation to ensure that they still comply with the criteria. Again, you're unlikely to see this unless you're purchasing Australian brands in the UK. As cruelty-free brands have to pay for certifications, sadly, some choose not to. This can be super confusing for conscious consumers both new and experienced. The good news is is that brands who aren't in the program are developing their own labelling. There has been some discussion that there are fake cruelty-free logos out there so you should do your research before buying from a brand you don't recognise. Most will state their animal testing policies on their websites. If not, don't be afraid to contact them for clarification. Whether you've been cruelty-free for a while or you're just starting out, my top tip to buying cruelty-free on your weekly shop is to go own-brand. 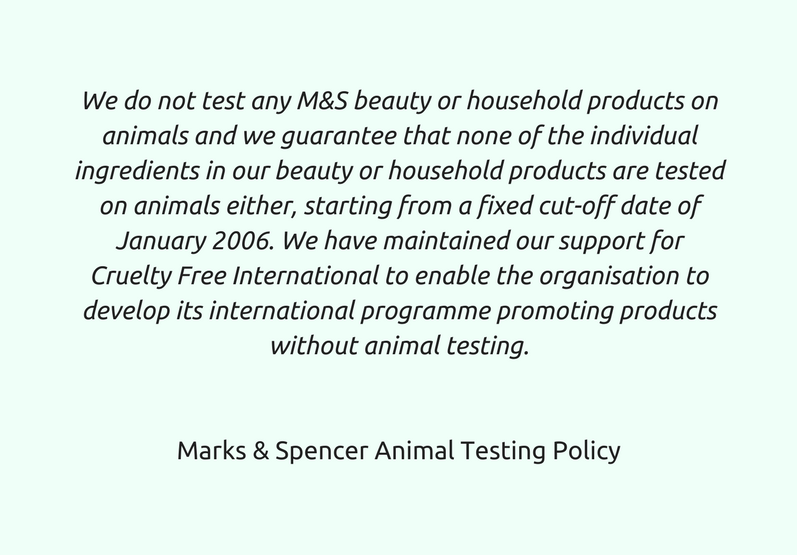 Sadly, majority of the major brands you see in your supermarket sell in China, which therefore means testing is required. 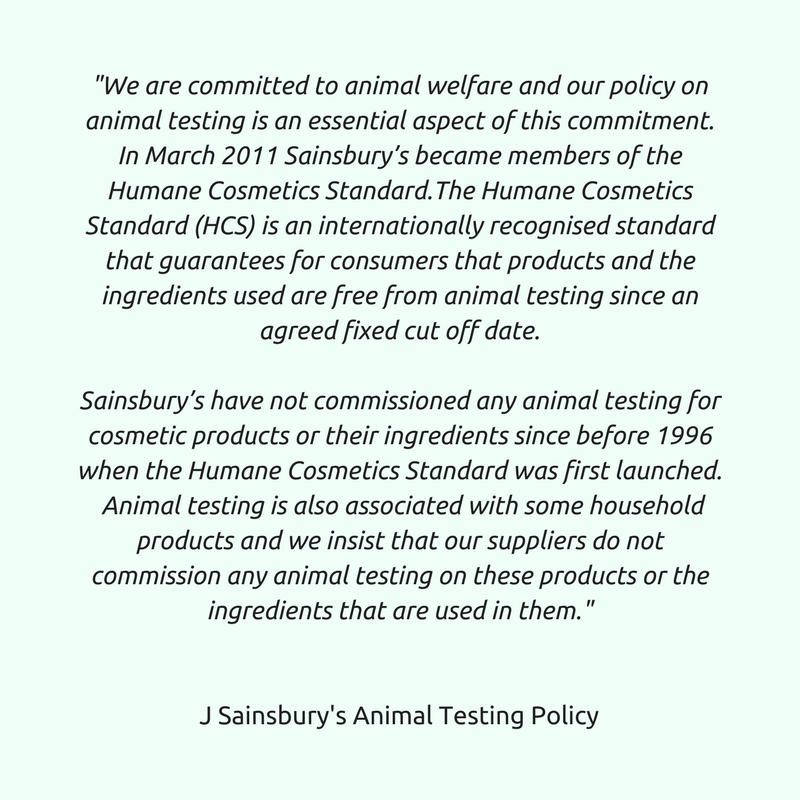 Most major UK supermarkets have wised up to the fact that consumers are more aware than ever before when it comes to animal testing and either display the Leaping Bunny Logo or their own version. 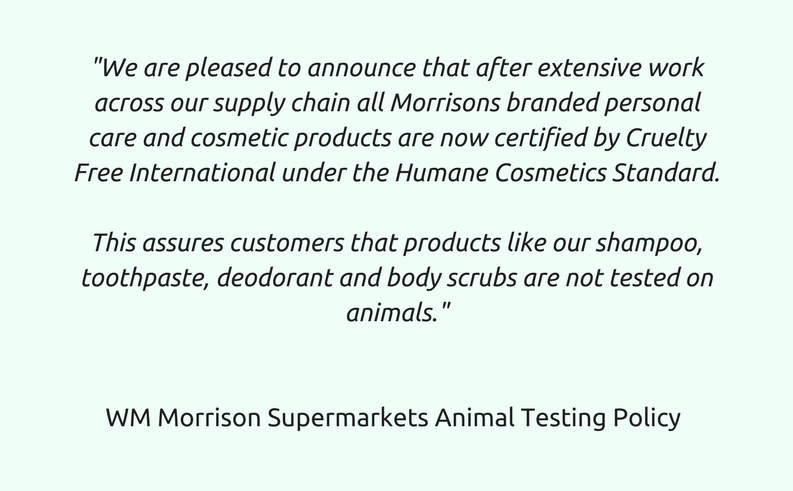 Here's what the supermarkets say and which of their products are cruelty-free. Sainsbury's - Own-brand personal care and household products display the Leaping Bunny logo. 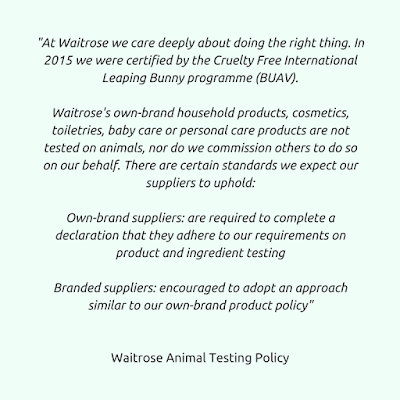 Waitrose - All of their own-brand personal care and household products proudly display the Leaping Bunny logo. Aldi - A new addition to the group, Aldi now have Leaping Bunny Certification and it is displayed on their own-brand household cleaning products. They are currently working towards Leaping Bunny Certification for their own-brand personal care range and hope to have this by the end of 2017. 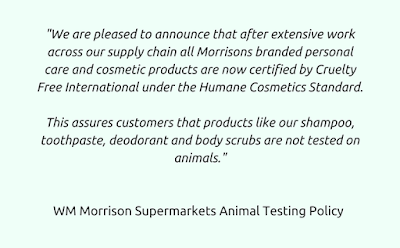 Morrisons - They state that all of their own-brand personal care and cosmetic products are cruelty-free and carry the Leaping Bunny logo. 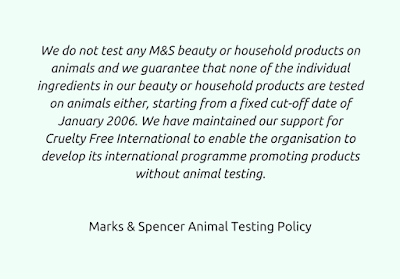 Marks & Spencer -They offer a great range of own-brand cosmetics, personal care and household products, all of which carry the Leaping Bunny logo. 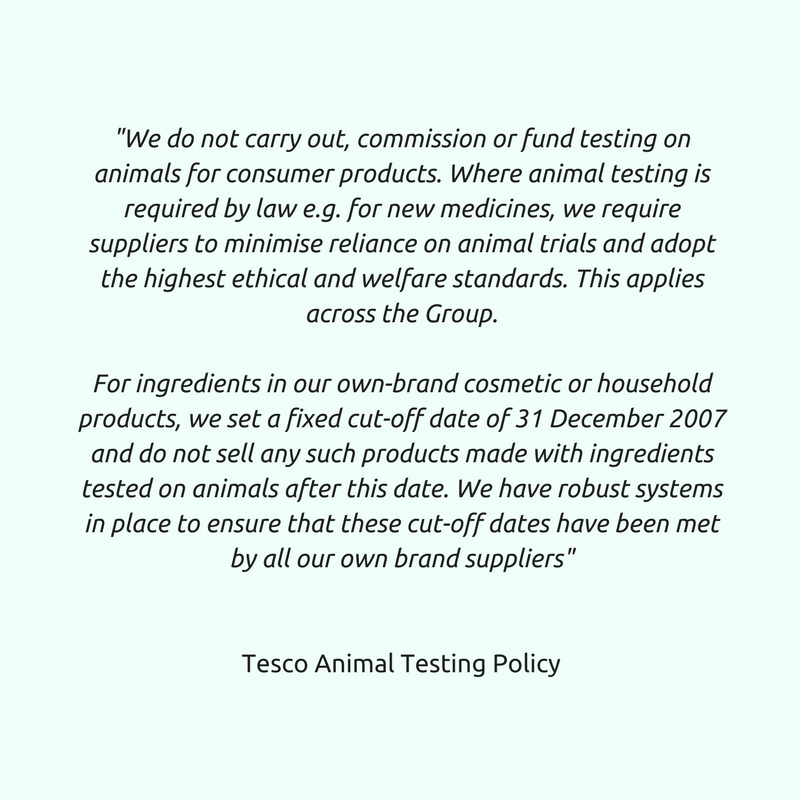 Tesco - All own-brand personal care, household and cosmetics are cruelty free. 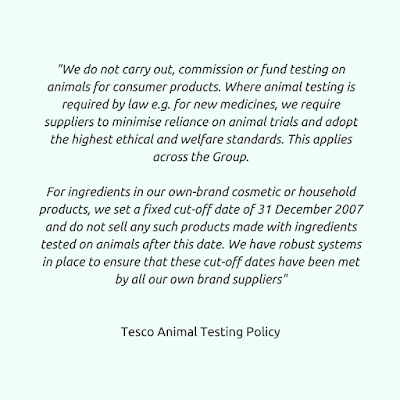 Tesco currently aren't part of the Leaping Bunny Certification Programme but they have designed their own labelling which is clearly displayed on their products. 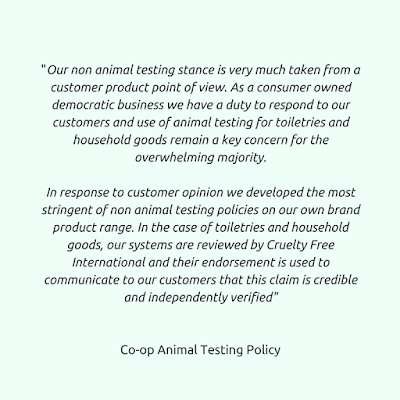 Co Op - They were the first retailer to be awarded the Leaping Bunny logo on their own-brand personal care and household products. Sainsbury's and Waitrose are my favourite supermarkets for buying cruelty-free as they have so much on offer. I find toothpaste and mouthwash are two of the hardest things to buy cruelty free on a weekly shop and I adore Sainsbury’s brand Oral Care named OraCare. It's so reasonably priced and a great alternative to the big brands that test. In regards to Waitrose, I regularly use their own-brand Sensitive Shower Gel and Watermelon Hand Wash. Not only can you buy their products in-store and on their website, you can also pick them up from Ocado. If you follow me on Twitter or have read my past health diary posts, you'll know I have a Chronic Illness called Ehlers Danlos Syndrome. The condition (of which there is more than 1 type) causes extreme joint pain, chronic fatigue and is often linked with many other health conditions and complications. Although my condition cannot be cured, there are aids that help with everyday life that I now just simply couldn't live without. 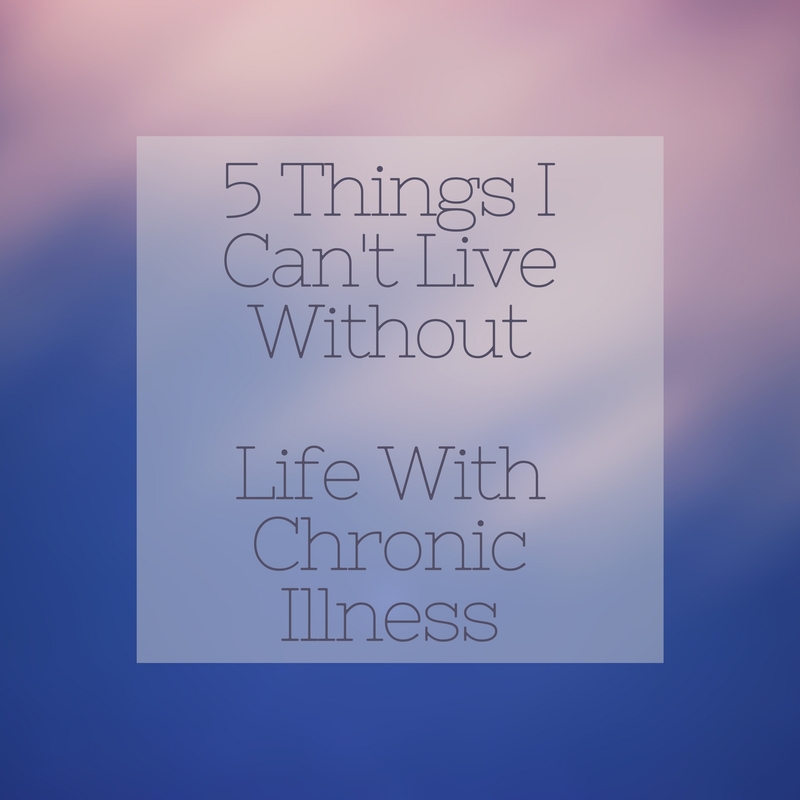 I thought it would be great to share my tips with other Chronic Illness warriors or anyone struggling with their health. TENS Machine A TENS machine is a small electronic device which emits electrical impulses through electrodes and into the body. It works by sending pulses along the nerve strands which help prevent pain signals reaching the brain. You're likely to experience a tingly sensation which can feel strange for first time, newbie users. I use a TENS machine regularly on my back, shoulders and lower abdomen and it really helps to lessen muscle pain around the joints and ease period cramping. You're able to adjust the machine from 1 to 10 depending on your level of pain. The machine I purchased has variable pulse rates and pulse widths so you're able to adjust to your specific needs. Most come with different modes including constant & modulation which gives you even more control. The machine can be clipped to your clothing and worn throughout the day, under clothes discreetly. I rely on my TENS so much as it helps keep me away from taking prescribed painkillers everyday. I purchased mine here. Electric Heat Pad Heat helps ease my joint pain more than anything else and before I discovered heat pads, I was getting fed up of having to refill a hot water bottle every 15 minutes. A heat pad presents the same comfort and warmth of a hot water bottle with the benefit of lasting heat. They're usually rectangle in shape although there are others on the market targeted to specific areas of the body. Often quilted, they are super comfortable to hold close, lay on or wrap around you. I've worked my way through a couple of brands over the last couple of years and because of the great amount of use, they last no longer than 2/3 months. I'm currently using this Heat Pad and I love how comfortable the outer fleece cover is. The control panel is large in size making it incredibly user friendly for anyone who suffers finger joint pain or Arthritis. I honestly cannot recommend Heat Pads enough, they are magical! Tisserand Aromatherapy Roller Balls I received a set of roller balls as a gift last Christmas and I've made good use of them in the last 6 months. I received De-Stress, Pause and Harmony. As the names suggest, they all have a unique blend that is suited to the bodies specific "need". Due to anxiety and joint pain, I often find it difficult to fall asleep and the De-Stress blend helps me to relax and to forget about the days woes. I apply this to my temples, wrists and behind my ears just before going to bed. Tisserand have many other blends on the market, you won't struggle to find a blend that suits your needs. Magnesium Bath Flakes It's no secret that over 90% of us have some sort of Magnesium deficiency and a quick online search will show you the many symptoms related to low levels. It's crazy to think that one mineral can affect the body in so many ways. As someone who lives with Chronic Illness, Magnesium plays a big part in my life and basically, keeps me going. I add a handful of flakes with a few drops of essential oils (whatever I fancy!) to a hot bath and relax. For me, it works wonders with joint pain, chronic fatigue and headaches. You can buy flakes from most online health shops and if you're quick, you can sometimes pick them up in TK Maxx for a really reasonable price. Memory Foam Pillow This may be an obvious one but I'm still going to shout about it. Neck and back pain is a real struggle for me when I'm trying to fall asleep. I often found myself waking up with an incredibly stiff neck, unable to move freely which then caused tension headaches. Since I switched over to a memory foam pillow, I've seen a significant improvement and I feel a lot more supported. I think sometimes we get "attached" to our old, limp pillows but the reality is, they offer little or no support to our neck and shoulders. Nowadays, memory foam is a lot more affordable and I picked mine up from Matalan for a very reasonable price. It's time to let go of that old pillow! I would love to hear what works for you, please leave a comment below! Subscribing to a monthly Cruelty Free beauty box means I get to try out a variety of products and brands. I have been subscribed to the Love Lula beauty box for around a year and during this time, I have discovered so many lovely products. You often see the same brands popping up and that's great if you enjoyed one of their products from a previous box. 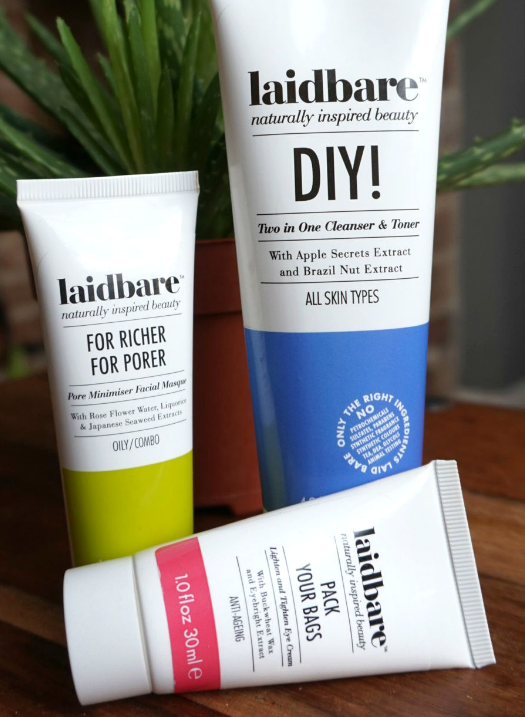 These Laidbare products were all from the Love Lula box over the last year and I've saved these to write an honest review. I've never been a massive fan of facial toner's but I couldn't praise this 2 in 1 enough. On a full coverage make-up day, I use the Kat Von D Tattoo Lock-It Foundation and if you have worn this foundation, you'll know the staying power of it and that includes trying to wash it off! This gel formula cuts through the foundation and you're instantly able to wipe it away. I love the juicy subtle apple scent. You really don't need a lot of product so I imagine this tube will last a good while. I use this once a day and finish off with a facial moisturiser. I will certainly be repurchasing once this runs out. This product contains Brazil Nut Extract so if you have a nut allergy, please bare this in mind. I'm a big fan of face masks and for me, it's the ultimate treat and a great way to relax. This mask is definitely more gentle than others I've used. It's creamy, soft consistency glides onto the face and neck with ease. It has a natural, gentle exfoliant which I think is the Japanese Seaweed. As for pore minimisation, I haven't really noticed a difference. 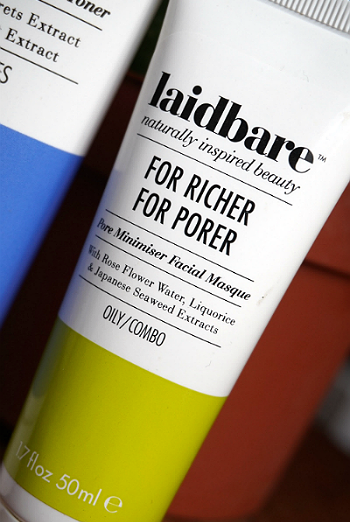 I have very large pores and I prefer a harder exfoliation for this area. Although the mask says it suits Oily/Combo skin, it's great for dry skin as well as it's so moisturising. This is a good everyday, gentle face mask to help replenish moisture. This product contains Palm Oil, see my thoughts below. As a Chronic Illness sufferer, I often have sleepless nights and the dark eye circles to go with it. I have sensitive under eyes and in the past, certain eye creams have stung and caused redness. 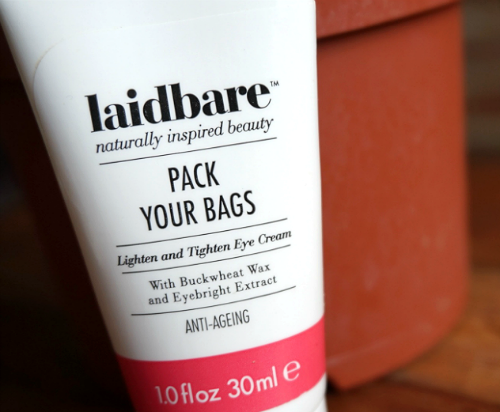 This eye cream is gentle and soaks in quickly, offering intense moisture. The magic ingredient, Buckwheat is known to help reduce puffiness and lighten dark circles. I dab a small amount underneath my eyes and towards the corners every night and it really does help to diminish the dark circles. Please note this product contains Palm Oil, see my thoughts below. Sadly, as the Eye Cream and Face Mask both contain Palm Oil (which is a massive shame), I will not be repurchasing as I'm starting to reduce the use of Palm Oil in my home. Unfortunately it's used widely in food and beauty products so it can be very difficult to completely cut it out of our lives. This shouldn't and isn't meant to discourage you, every small change helps and I hope by making these changes that unethical Palm Oil will one day be a thing of the past. 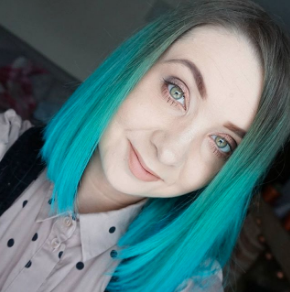 I'd love to hear you thoughts on the products I've reviewed and your views on Palm Oil. Please leave a comment below.